Here is some promising technology for addressing the release of methane gas and cleaning polluted ponds, lakes and water bodies. “I’m sending you this information as you have an interest in water in the north and I would like to share with you a major environmental issue being experienced in the northern tundra around the world. That is the thawing permafrost. People of the north are able to drill holes in the ice on lakes and light flares up to 60 feet high with the methane gas collected from the water under the ice. I understand the concentration of methane is so high that in some areas the gas can be collected, dewatered and placed in a pipeline. “As indicated in my letter below to Canada’s Minister of Environment, northern Canada is undergoing a major climatic change that is causing the permafrost to thaw. In doing so, major quantities of methane (potent greenhouse gas) and other toxic gases are being produced in the multitude of lakes in northern Canada. We believe that through a prudent placement of our mitigation systems, very large areas can be impacted to reduce/eliminate the generation of methane and other toxic gases. I don’t believe such an approach is being considered anywhere else in the world. The rapid thawing of the permafrost that is occurring is releasing huge amounts of carbon into the environment in the form of carbon dioxide, water containing organic carbon, and methane. Water, rich in organic carbon, is collecting in lakes in the north and rapidly uses up the oxygen in the lakes producing carbon dioxide. The lakes become deprived of oxygen and then methane is formed. 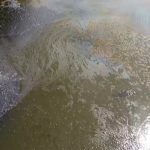 There are now thousands of lakes in the north that are bubbling with the release of methane gas, which is a potent greenhouse gas (26 times worse than carbon dioxide). I would like to propose a viable solution to eliminate the methane production in our northern lakes. Some EOS Systems have been maintaining aerobic conditions and enhancing lakes and lagoon operations continuously since 2007 including Vale-Inco tailings pond in Sudbury, municipal sewage lagoons and lakes. WCI Environmental Solutions Inc. is an Ottawa-based environmental engineering company that works with government sectors, industries and other clients to put in place innovative solutions for pressing environmental problems that are affordable, sustainable, and practical for the community.